Between 1994 and 1997 I worked on setting up the Conflict Data Service, one of the first Internet services on conflict and ethnicity. I was based at INCORE, the International Conflict Research Centre of the University of Ulster and the United Nations University. During that time I organised two conferences on ‘The Future of Internet Services in Conflict and Ethnicity’ that involved participants from several of the key online services from across Europe and North America. Drawing on that experience I published The Internet Research Handbook in 2002. 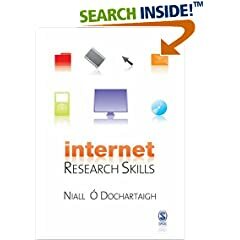 (2007) Internet Research Skills: How to Do Your Literature Search and Find Research Information Online. London; Los Angeles; New Delhi: Sage. (2002) The Internet Research Handbook. London; Thousand Oaks; New Delhi: Sage. (2002) 11 steps to Effective Searching. An edited extract from the Internet Research Handbook. Niall, from a first year PhD student, let me thank you for this excellent source. Rónán.